When a transaction is finalized, state "(proposal) is accepted" in your bolded player color"
It helps separate the offered proposals from the finalized accepted ones. Exhaust my remaining influence-carrying planets to put 4 votes AGAINST. Ball is in @Hedgethorn's court. 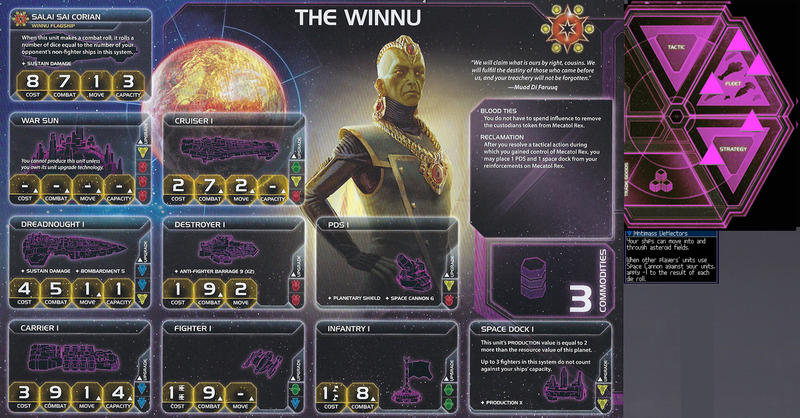 @Preda's proposal to exchanging Support for the Throne with the Winnu is ACCEPTED. Cast 14 votes FOR the motion. @Brody for the final vote. Oh, I missed seeing that proposal. Really shows how little attention I've been paying, yikes. Sorry Blarney, even if I wanted to swing against into a win, there are too many votes on the other side. My Diplomacy Rider card succeeds; everyone please place a command token in Mecatol Rex. 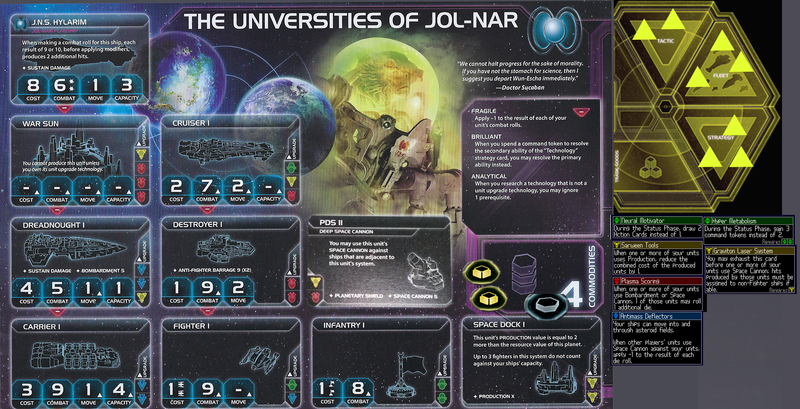 Jol-Nar promissory note: Research Agreement- After the Jol-Nar player researches a non-faction technology, gain that technology. Then return this card to the Jol-nar player. L1z1x promissory note: Trade Agreement- When the L1z1x player replenishes commodities: the L1z1x player gives you all of his commodities. Then return this card to the L1z1x player. Arborec promissory note: Trade Agreement- When the Arborec player replenishes commodities: the L1z1x player gives you all of his commodities. 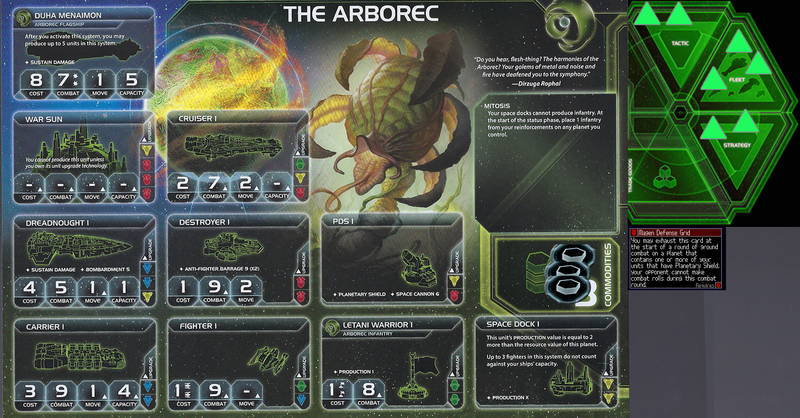 Then return this card to the Arborec player. L1z1x promissory note: Cybernetic Enhancements- Play at the start of your turn, Remove 1 token from the L1z1x player's strategy pool and return it to his reinforcements. Then, place 1 command token from your reinforcements in your strategy pool. Then return this card to the L1z1x player. Cruess promissory note: Support from the throne. Gain 1 victory point. If you activate a system containing Cruess' units, lose 1 victory point and return this card to the Cruess player. Everyone double check to see if all changes accurate. I'm going to start keeping and posting a change log like MrBlarney does, both for my record keeping sake and a clearer picture for everyone else. @MrBody I should have 2 tactics and 2 strategy tokens after the status phase. Everyone else's might be wrong too, I'm not sure. Edit: Also, I forgot to put infantry out during the status phase again. One infantry on Quann please. Other oops, never got the 2 command token allocation from the status phase for @Preda, who is also up for strategy pick. Ops... 2 tactics, than I take Leadership. I would take Imperial, but with Mecatol Rex blocked off due to that Diplomacy Rider, I'm much less incentivized to pick it up. Why should I stunt my game so that everyone else can benefit? What do I get out of it? I'd much rather pick up Construction so that I can shore up my currently-lacking infrastructure. Let him get one more VP, then if someone else takes Speaker afterwards, we can start fighting it out more earnestly next round. I'll hold on locking my pick in for a little bit in case there are other arguments. Taking it yourself gives you 1VP from an early claim and a fresh secret objective to give another route to another. Man, I don't think I'm in a position to pick up any of those public objectives in the middle of the round. Spending three command tokens, maybe, but I could just as easily grab that at the end of the round so I can be flexible about actions during the Action Phase. I'm probably not going to have enough research performed, either. Yes, I do have your racial promissory note to get more tech, but are you willing to coordinate your purchase for my benefit in that case? 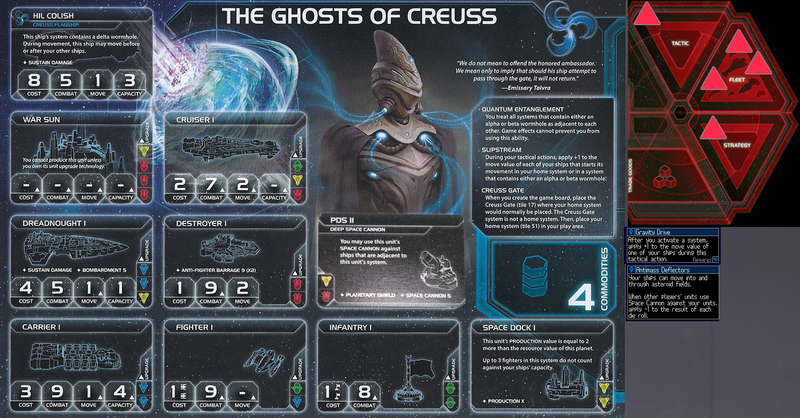 As for Creuss, I don't think they're in a position to grab two Public Objectives this turn, so they probably won't get anything extra out of the Imperial strategy outside of the 1 VP. Yeah I can make sure not to pick a technology in a colour you already have two of. That's enough thinking for now. Because of the order of operations, I'll have to choose my tech before Jol-Nar, something that doesn't play well with what I want to get. Select the (4) Construction Strategy Card. @Elvenshae is up for strategy card selection. So, I'd just like to point out that while I do currently have 2 VPs, only one of them is actually "mine." The other one is on-loan from our good friends the Letnev. 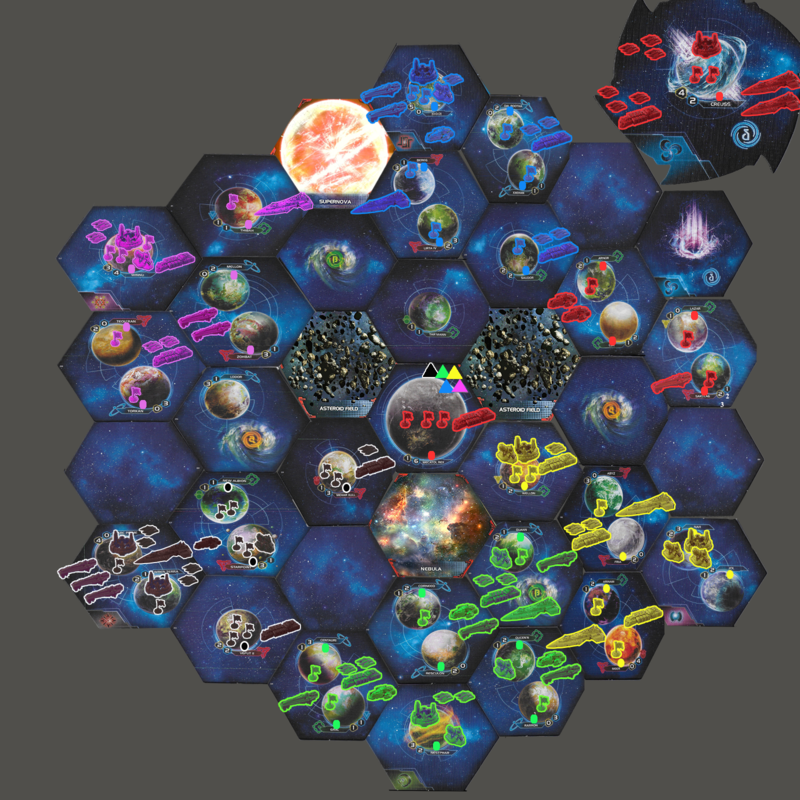 Meanwhile, the Jol-Nar have claimed a victory point through an objective, and there are two more technology-related objectives they have yet to claim. If there is anyone we should be looking at askance, it is the science fish! Why do I get the feeling that Warfare is coming my way? It's all the plotting isn't it? Let me show you... Leadership. Follow in the Letnev's footsteps, and know glory! Exhaust Rarron (3), Centauri (3), Gral (1), and Corneeo (2) for 9 influence. Add one tactics token, one strategy token, and one fleet token. @Brody we approve of this Leadership initiative, and applaud the forward-thinking nature of our Letnevian friends! Exhaust Mecatol Rex, Arnor, and Lor for 9 influence; 3 tokens into Strategy. Exhaust Dal Bootha (2I) and Xxehan (1I) to gain 1 token in Strategy Pool. Play secondary. 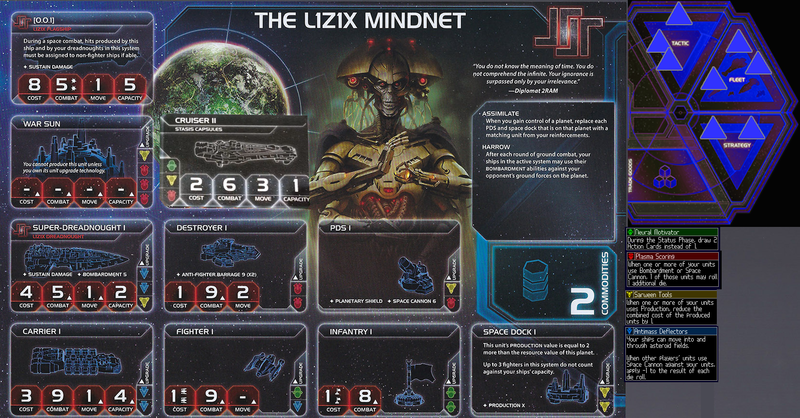 Exaust Torkan, Mellon and Tibah for 2 Token, I strategy, 1 Fleet. @Mojo_Jojo Looks like you've only got 1 commodity, yes? I'll exchange 1 for 1. Give Jol-Nar one commodity in exchange for one commodity. Play Politics, making myself the new speaker. Draw 2 action cards, look at the top 2 of the agenda deck. 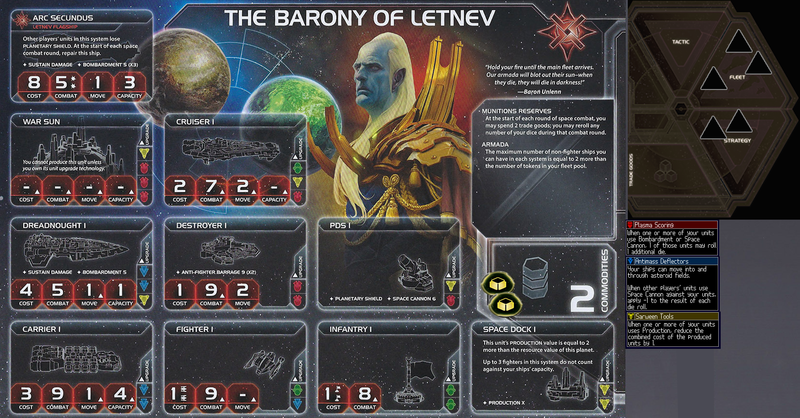 Letnev will play your Politics game... for now. -1 Strategy token, leaving me with 3/3/2 and drawings two Action Cards! Why should I be surprised, when the action was started by shouting POLITICS! When we rule the galaxy, there will be none of this smoke and mirror bs.